Bryce Van Brabant started the Bobcats off right where they left off following last night’s overtime victory. Just 1:51 into the first period, Van Brabant took a pass from Mike Dalhuisen in the neutral zone and took a slapshot as he passed the blue line. The shot rocketed over Harvard goaltender Raphael Girard’s left shoulder and gave the Bobcats a 1-0 lead. The Bobcats wouldn’t look back and defeated the Crimson, 6-2. No. 5 Quinnipiac (16-3-2, 10-0-0 Eastern Collegiate Athletic Conference) proved their national ranking tonight and extended their unbeaten streak to 14 games, the longest in Division 1 hockey as well as the longest streak in program history. They also improve to 13-0-2 on the season when scoring first. Later in the first period, freshman Travis St. Denis made it a 2-0 lead on a one-timer from the slot. Ben Arnt blocked a clear attempt in neutral ice and sped down on a 2-on-2 with St. Denis. Just as he skated past the left circle, he hit St. Denis with the pass to pick up his fifth assist of the season. Harvard (4-7-1, 3-5-0 ECAC) would answer late in the period as both teams battled for the puck against the boards behind the net. Alex Fallstrom would eventually get the puck over to Marshall Everson who found Luke Greiner who sniped it past Bobcat goalie Eric Hartzell. In the second period, the Bobcats got a pair of power play goals. The first coming off the stick of Matthew Peca assisted by Arnt and Loren Barron and the second goal coming from Barron with assists going to Connor Jones and Peca. Barron, who came into the game as the leading defensman in assists and points added to both of these columns with his goal and assist, giving him three goals and eight assists for 11 points on the season. He is also the Bobcats active leader in assists with 45. Cory Hibbeler and Dalhuisen would add goals later in the second and third, respectively to make it a 6-2 game. 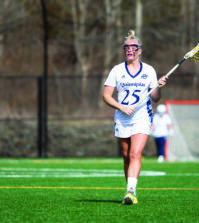 Though the Bobcats top 25 offense clicked well tying their season high with six goals, the team played with a lack of discipline resulting in eight penalties. But, the Bobcats penalty kill unit came into the game as the third best unit in the country killing 93.3 percent of their opponents opportunities. Tonight, they allowed one goal on eight Crimson chances. The Bobcats converted on two of six power play opportunities in the game. 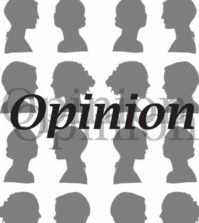 As the Bobcats continue to extend their streak, the national attention begins to build. But Pecknold believes Quinnipiac has had a good hockey program for years. The backbone of the success though has come from Pecknold’s starting goaltender, Hartzell. Hartzell came into the game at third in the nation in goals allowed average at 1.4540 per game. He is also tied for second in shutouts with four and is 12th in save percentage at .935 percent. “Hartzell has been great, he made some great saves tonight when we really needed him to,” Pecknold said. Hartzell made 21 saves on 23 shots tonight including a huge 3-0 save in the second period. 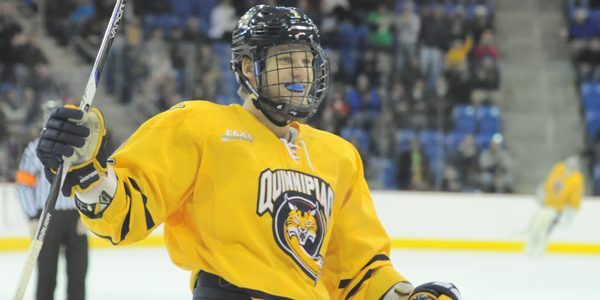 Quinnipiac will look to extend their unbeaten streak on Friday Jan. 11, when they host Rensselaer at 7 p.m.